"This is a traditional Southern dish for bringing good luck into the New Year, consisting of black-eyed peas and rice. Eating Hoppin' John on New Year's Day is thought to bring a prosperous year filled with luck. The peas are symbolic of pennies or coins, and a coin is sometimes added to the pot or left under the dinner bowls. Greens along with this dish are supposed to also add to the wealth since they are the color of money. Eating this the day after represents frugality and savings. You are supposed to leave 3 peas to assure that the New Year will be filled with Luck, Fortune and Romance. Serve hot with corn bread." Cover black-eyed peas with water in a large soup pot, bring to a boil, and boil for 2 minutes. Reduce heat to low and simmer peas for 1 hour. Drain. Dissolve vegetable bouillon cube in 1/4 cup hot water in a small bowl; pour bouillon into slow cooker. 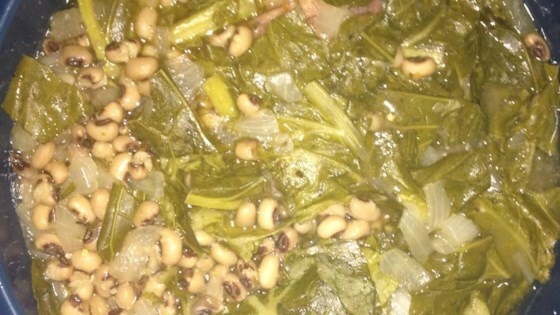 Stir black-eyed peas, onion, garlic, ham hock, collard greens, oregano, red pepper flakes, and vegetable broth into the cooker. Add 5 cups of water or as needed to cover. Cook 5 hours on High. Stir rice into stew and cook 1 more hour. Remove meat from ham hock, chop meat, and return to stew. Season with salt and black pepper. You can use collard greens, turnip greens, or kale. Rice can be cooked separately and served with peas. If using bacon in place of ham hock or turkey, fry the pieces first and drain on paper towels to remove excess fat. Vegetarian version: Used a couple drops of Liquid Smoke to replace the meat flavor. Used kale because that's what I had. Delicious! Good recipe! Waited till the end to add rice and cooked until done. Added extra ham.